Wow - this message is pretty clear. Artist SERVER presents "The Death of Street Art". 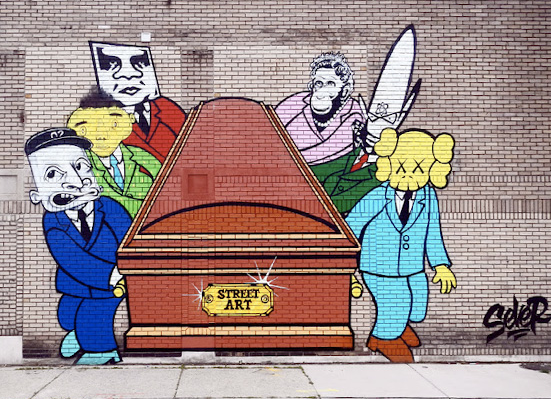 Placed in downtown Detroit, Server took popular imagery from artists such as Shepard Fairy, Kaws, Banksy, Barry McGee, and others, showing them carrying the casket of Street Art. Has all of the mainstream media attention that's been given to Street Art these last couple of years resulted in watered downed messages? Have we reached a point of over-saturation? Are these artists, dare it be said, selling out to corporate America? Only time will tell. Picture via HB.